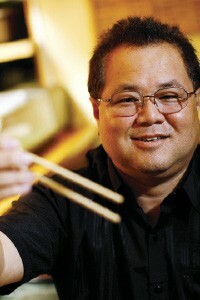 Restauranteur Jimmy Ishii is a man of many talents. Jimmy Ishii never sleeps. Sure, he grabs a catnap here and there, but for nearly 20 hours a day, the restaurateur is on the move — working, driving, teaching cooking classes, or closing his next deal. A Memphis resident for decades, Ishii's energy level is more in tune with his native Japan. He's constantly on his cell phone — talking food, music, and travel — the words tumbling from his mouth as fast as he can shape them. Ishii was born in the shadow of Mount Fuji in Kofu, the capital city of Yamanashi Prefecture, which is located on the island of Honshu. He learned English as a teenage exchange student in New York. A few years later, he decided to attend college at St. Louis University. 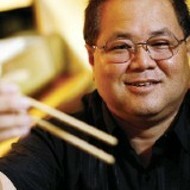 In the late 1970s, he began working for Robata of Japan, the sister company of the Benihana restaurant chain. Then Benihana offered him a permanent job and a green card to go with it. "Benihana brought me to Memphis in the early 1980s," Ishii explains. "I worked for them for a long time, and then they asked me to be their head executive chef in Chicago. It was a very big promotion for me, but I decided to open my own place, a Memphis sushi restaurant, and so I gave them one year's notice." In those days, Memphians viewed Japanese food as a novelty. In fact, eating raw fish was a relatively new notion, even in Japan. As documented by author Trevor Corson in The Zen of Fish: The Story of Sushi, From Samurai to Supermarket, coastal fisherman began packing fish into jars with cooked rice and selling the preserved delicacy to the aristocracy nearly a thousand years ago, but sushi as we know it didn't come into existence until the mid-1800s. Although sushi stalls proliferated on the streets of Tokyo, occupying Allied forces banned them shortly after World War II. The food didn't appear stateside until the 1960s, when a Los Angeles-based sushi bar called Tokyo Kaikan became a big hit with the Hollywood set. Fast-forward 20 years. Benihana and Nagasaki Inn were Memphis' only flashy, slice-and-dice hibachi steak houses, while Edo and Sakura focused on traditional dishes like yakitori and gyoza. Sushi, in its native form, was nonexistent in the Bluff City. "On Wednesday nights, Edo had sushi," Ishii remembers, "but they made it in the kitchen, not at a sushi bar like they do in Japan." Humphreys Center opened in September 1989. "I didn't want to compete with Edo or Sakura," Ishii says. "I wanted to open an upscale restaurant with more seats. I tried to make it authentic, with a tatami room and a sushi bar," he adds, describing the conventional Japanese décor of straw floor mats and shoji room dividers, made high-tech with the addition of large-screen television sets that broadcast sumo wrestling matches around the clock. Initially, banks were reluctant to gamble on his idea. Perhaps they thought the then-28-year-old entrepreneur was in over his head or that sushi was a short-lived fad. Either way, several would-be investors flipped through Ishii's inch-thick business plan and shook their heads no. "A small bank, the Community Bank of Germantown, finally financed me," Ishii says. "They were the only ones willing to give me that $75,000 chance. For the first five years we were open, I didn't take a day off, and we were open seven days a week, except Thanksgiving, Christmas, and Super Bowl Sunday." Today, Ishii owns a travel company, eight area Japanese restaurants, and nine more scattered throughout the Southeast, in cities such as New Orleans, Little Rock, Jacksonville, Nashville, and Chattanooga. He's a major investor in Excel, Inc., an Alabama-based supplier to Japan's cultured-pearl industry. He's also a partner in a handful of high-profile (and diverse) Memphis restaurants, including Bari Ristorante, Dish, and Beale Street's EP Delta Kitchen & Bar, which opened earlier this year. "Jimmy is a very genuine, giving person," says Rebecca Severs, who, with her husband Jason, owns and operates Bari. She initially worked at Koto, a now-defunct Ishii restaurant, while Jason cooked at the Cooper-Young nightspot Melange, which is now Dish. "When we decided we wanted to open our own restaurant, we asked Jimmy to be our partner," Rebecca says. "In November, we'll be open five years. I don't think local diners have a sense of what he's involved in. He's all over Memphis, and he's always looking for the next thing." 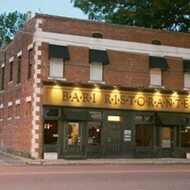 Ishii wasn't familiar with the Adriatic fare offered at Bari, says chef Jason Severs. "We went to Italy together, and I showed him what typical life was like there," he says. "Jimmy couldn't believe how much raw seafood they eat. Now, he wants to take me to Japan." Ishii's Japanese heritage influences his interest in other cultures, Rebecca says. "He wants people to experience different things, and he realizes there's a market for it," she explains. "Jimmy brings a lot of Japanese friends in here for dinner, and then he takes them down to EP for entertainment." 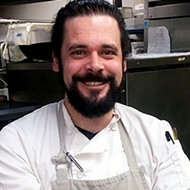 Chef Erling Jensen also enlisted Ishii for help when he opened his namesake restaurant on South Yates Road in 1996. "We met in the late '80s, and when we opened, he was one of the partners here, although we bought him out two or three years later," says the Danish-born Jensen. "Jimmy has put a lot of people in Memphis in business." "The customers don't get to see how fresh the fish is, but that's the hardest part of this business," Ishii says one morning, as he glances over his inventory and discusses placing a seafood order with one of his Japanese purveyors. "I believe I'm the first to bring big-eyed sushi-grade tuna to Memphis. They used to come on Greyhound buses twice a week from Chicago. Now, I get them FedExed here directly from Hawaii or from Los Angeles via Northwest Airlines." Twenty-seven sushi chefs — there are a few females and just seven Japanese natives in the bunch — prepare rolls and nigiri in Ishii's Memphis-area restaurants. 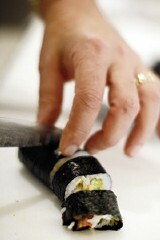 "Real sushi, or nigiri, is small, and it [consists of] rice and fish," Ishii notes. "Americans like the cream cheese and the fried ingredients. They get excited about California rolls. In Japan, that's not even available." Another difference is how Americans order sushi. In Memphis, diners fill out a sheet with their selection, but in Japan, it's always chef's choice. "We try to do that here," Ishii says. "My chefs have to really communicate with the customers. They get instant feedback. This isn't convenience-store sushi. Every part of the order is fresh." Once or twice a month, Ishii also teaches sushi-rolling classes for Viking Cooking School, locally and at locations in Atlanta, Nashville, St. Louis, and Greenwood, Mississippi. At the brand-new Viking facility at the Park Place Mall in East Memphis, he carefully guides his students through the construction of a California roll, a cone-shaped hand roll, and a maki-style roll, which might include a few types of fish, diced vegetables, and spices. He gently talks his way through the process, but his hands fly as he applies a precise amount of sushi rice to a sheet of dark green nori and piles on the ingredients. Then he effortlessly rolls the entire shebang into a perfect cigar shape and magically waves his knife until he has a plateful of beautifully arranged sushi. The novices watch, slack-jawed, then try to imitate the master. Half an hour later, they're still wrestling with sticky rice grains and soggy nori paper, flakes of spicy tuna adhering everywhere but within the roll. 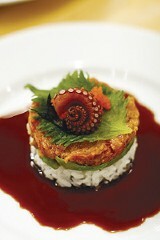 Meanwhile, Ishii putters about, creating works of art out of octopus, daikon radishes, and pickled ginger. It's not that he's a bad teacher — Ishii has the patience of Job and enough self-restraint to keep from laughing at his ham-fisted students. But with every lesson, Ishii proves that two decades of sushi-rolling practice cannot be distilled into a two-hour workshop. Even so, the chance to work alongside him is irresistible, and the class is perennially sold out. As a businessman, Ishii seems to have the Midas touch, but he has a heartfelt human side as well. Twelve years ago, the restaurateur won the admiration of the Memphis restaurant community when he stepped up to help a friend in desperate need. "On January 30, 1995, I got the contract for the Midtown Sekisui on Belvedere, and then I met Bernard Chang for Chinese New Year. The next afternoon, I closed the deal on Midtown, and then on February 1st, Bernard got stabbed," Ishii recalls. The chance to work alongside Jimmy Ishii at the Viking Cooking School is irresistible. The class is perennially sold out. Chang, the proprietor of China Grill, a popular Overton Square eatery, was assaulted by a disgruntled employee. For weeks, he hovered between life and death. Ishii postponed the opening of his new restaurant for six months, stepped in to temporarily helm China Grill, and organized several benefits for his injured friend. "What he did might have been an unusual move for [other chefs], but that's just the way Jimmy is, which is always helpful," Jensen says. The following July, Bernard passed away, Ishii remembers: "Sure, I'd lost money, but through it all, my business kept growing. I took over Bernard's concept of pan-Asian food, and that's when I decided to open Pacific Rim." 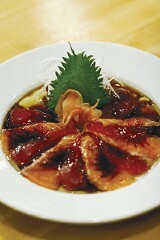 Today, Sekisui Pacific Rim in East Memphis is one of Ishii's most successful restaurants. 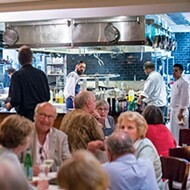 The bistro menu includes dozens of seafood offerings, such as escargot, stir-fried and served in a wonton shell, fried oysters topped with fiery Asian salsa, and crab cakes served on a bed of seaweed. Since opening the restaurant in 2000, he's expanded the concept to St. Louis and Birmingham. "I'm in nine states now," the tireless Ishii says proudly. "I drove 170,000 miles last year. Half my time is spent on the road. In Memphis, I have more than 300 employees. "I have a concept for one more Memphis restaurant," he adds, his eyes twinkling. "Italian-Japanese food. Zipang," he says, dreamily. "Maybe it will be an East-meets-West thing." Echoing the words of Bari's owners, Ishii adds, "I think the two cuisines are very close. Both have seafood and fresh vegetables and not too many sauces." When he's not talking shop or adding employees to his payrolls or ordering fish for his myriad sushi bars, Ishii is usually dining at one of his many restaurants, checking quality control with a famous friend or two, like actor Steven Seagal, who is a frequent Sekisui customer. During the rare moments when he's really off work — at home with his wife and kids — Ishii likes to wind down by watching Japanese TV via satellite. "I go back to Japan for business five times a year," he says. "I'm trying to open a restaurant there, but I'm mainly helping with licensing for Elvis Presley Enterprises, and I want to promote the Mississippi blues. I'm currently looking for artists to record here and work in Japan. 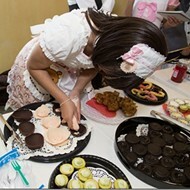 "Before, I was concentrating on introducing Japanese culture to Memphis. My next step is to introduce Memphis to Japan," Ishii continues, a smile on his face as he explains his plan to drive to New Orleans to help another friend, former Elvis guitarist James Burton, obtain a work visa for an upcoming Japanese tour. It's a pleasurable chore for the new American citizen, who was sworn in with 109 other immigrants during a ceremony at AutoZone Park on July 4th, 2006. "I'm really excited for more Japanese people to come and enjoy Memphis," Ishii says with a grin. "They know Memphis is the home of so much music, but they still ask, 'Where is it?' Now I have my tour company, which helps Memphians get educated about Japanese culture and helps Japanese people learn about Memphis." He sighs, mock-exhausted, and considers the alternative to his busy life. "People ask me to sell my businesses," he says, "but if I did, I wouldn't be Jimmy Ishii anymore."